Shapeless mess?? Did you fall asleep during the movie? Four story lines that intertwined perfectly ... well done! The right blend of politics, horror, romance, and comedy. As always, Del Toro's love for monsters and fantasy takes precedent over satisfying narrative. Not the best film this year but an unique experience !!! I can't believe how good this was ! Amazing, beautiful and stunning ! Twisted and delightful and wonderful!!! Cannot wait to watch it again. After deciding to watch the Shape of Water, I realized Pan’s Labyrith and Hell Boy were directed by the same director! Those are two movies I fondly remember. I was really looking forward to this movie! I am so glad that I didn’t set myself up for disappointment, by going in with a high expectation. 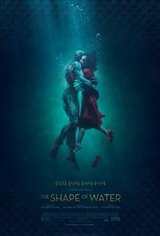 I like the Shape of Water, a lot! Powerful acting of the entire cast, especially the “Asset”. It’s less of a horror, comparing to the Pan’s Labyrinth. The theme of the movie was carried throughout and started as soon as the film rolls! This is the first in a long while that I feel my senses are “fed and full” after watching a great movie! I loved this movie sososo much!! I’ve been anticipating it’s release since September when I first heard about it. The visuals are gorgeous. I loved Dougs performance. I’ve always loved Abe from hellboy and Del toro provided me another fish creature to absolutely adore. Del toro at his best. A twisted love story like no other. So happy to see Del Toro doing another fantastical film like this. Shades of Pan's Labyrinth here but of course, very different. Visually dazzling as well. I would recommend it to anyone who appreciates his work. Well deserved of all the accolades. Great picture. LOVED IT! Although I knew I would. Simply dazzling, a great and unique story, wonderful actors, well done! Will be buying the bluray for sure. Idiot that continually uses the "anyone who doesn't agree with me should stick to Transformers" schtick should come up with a new line, and seek some psychological help. Human consciousness will never be a hive collective ruled by you or anyone else. Shapeless mess from the massively overpraised hack fatboy Del Toro. Crap. Couldn't wait to see this film. I want this in my collection. Masterpiece. Idiots that gave one star should just stick to Transformers.